Friend, how long has it been since you had a big ol’ bowl of healthy, hearty chili? Well, that’s too long! Store bought chili is high in fat and salt. And is lacking in flavor. 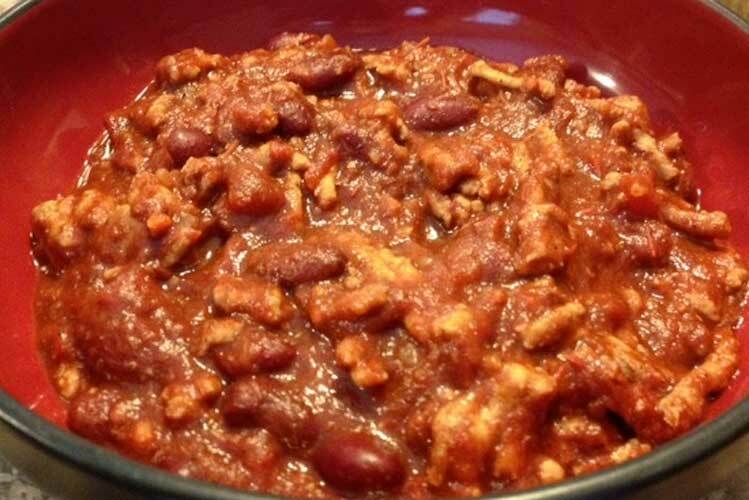 This recipe is healthier than any canned chili and is just as hearty. In addition, it has multiple flavor profiles that you can customize to your liking. You can make the base chili by leaving out all of the items marked optional. You’ll end up with chili that has good flavor and is far healthier than store bought chili but is a bit too bland for most Texans. Unless you have major problems with spicy foods, you should go all out and make at least one pot of Big Jolly chili – you won’t regret it! Also, the fresher your spices the better your cooking. Sure, it’s cheaper per ounce to buy a paint bucket full of chili powder but after it’s been in your pantry for 20 years, the flavor tends to have evaporated. Buy small jars of specialty spices. Your taste buds will thank you. The Maggi sauce might be hard to find but adds a hint of flavor that is so unique it is worth finding. If you are an Amazon shopper, they have it: Maggi Seasoning, 27-Ounce (800ml). I should also mention that this recipe works awesome in an Instant Pot. Not particularly time saving but it blends the flavors so well that you can serve it the same day you cook it. Traditional stove top cooking should rest overnight in the refrigerator and reheated the next day for the best flavor. You’ll notice that no salt was added, so you might want to have it available for your guests that are used to a saltier diet. Heat the oil in a large, heavy pot (6-8 qt) on the stove or use the saute function on your Instant Pot. Add the chopped onions, poblano pepper and jalapeño pepper. Stir for a minute or so. Add the ground turkey to the onion/pepper mixture and stir until the turkey is browned. Be sure and crumble the chunks while stirring. Drain the liquid from the pan. Add the remaining ingredients. If using the stovetop, bring to a boil, then reduce heat, cover and simmer for 35-45 minutes. Stir occasionally to prevent sticking. Let cool and refrigerate overnight, then reheat on medium until you get a slight shimmer on the surface, you do not need to bring it to a full boil. At that point, you are ready to serve. If using your Instant Pot, attach the lid and use the Chili/Bean button. It will set the Instant Pot to cook for 30 minutes. Let the pressure release naturally and you are ready to serve.